This is far from a radical new attack on America; it elucidates a longstanding politically correct view of US-China relations. For evidence we need only look to the words of the last two Chairmen, Hu and Xi, who have both repeatedly raised the issue of “hostile western forces” trying to undermine CCP rule. The carefully rehearsed on-camera comments from the leaders of important CCP organs including the directors of the MFA and MSS think tanks and CASS, as well as General Liu Yazhou himself, are further testimony to the mainstream nature of the tale being told. Silent Contest weaves together striking archival footage and quotes a wild array of personages — from US Presidents to Sarah Palin’s foreign policy adviser, from turn-of-the-century Iowan educators to Joseph Nye — in the skillful and dramatic style familiar to viewers of Adam Curtis documentaries. Background music alternates between Jaws-style terror (when US things are on-screen) and the shining hope of twinkly pianos (China/CCP). No one would deny that there are anti-China forces in the US, and understandably from the CCP’s perspective this includes pro-democracy and human rights groups. But this shockingly ruthless “policy” actually turns out be a hilarious fraud: a bit of googling and baiduing reveals it to be essentially the same spurious list circulated by US conservatives in 1946 to smear communists. (This would explain the deep concern with “pornographic books 色情书籍”). I would like to think the PLA producers of the documentary are enjoying the delicious irony of using warmed-over McCarthyite hysteria against the US in 2013. More likely though, they just ripped it from the Chinese internet, where it has circulated freely in BBS forums for years (e.g. here). The film’s most important point is to stress the importance of guarding against ideological infiltration as the reform and opening policies continue (and perhaps deepen after this month’s Third Plenum). It does not oppose reform and opening — in fact, on the contrary, it praises it lavishly. So it’s not an attack from the far left, or from a hardline faction, aimed at influencing upcoming major policy decisions. This [USSR collapse] occurred after the end of the Cold War, not before. This is a detail that absolutely must not be overlooked or misread. That is to say, the USSR collapsed because the Soviet Communist Party stopped fighting. At its core, then, this is a statement of the need for ongoing political warfare, particularly defensive indoctrination. Above all, it stands as a restatement of the importance of ideology — a message that the CCP-PLA propaganda authorities, of course, have a vested interest in maintaining, since it not only elevates their own importance, it is their reason for existence. I don’t buy the notion that it’s a genuine “leak” — meaning someone released it without authorization. It was deleted on October 31, after it had sat online for at least 4 days (and probably longer). But the CCP propaganda authorities have shown they are capable of ordering the removal of content they don’t wish to be there in a matter of minutes. Discussion and searching online has not shown much sign of censorship even now, after the video was deleted from almost everywhere except, of course, YouTube. Then there’s the fact that in general, the CCP just doesn’t leak, presumably because it would be difficult to do without getting caught, given the PRC authorities’ easy access to internet company records information. 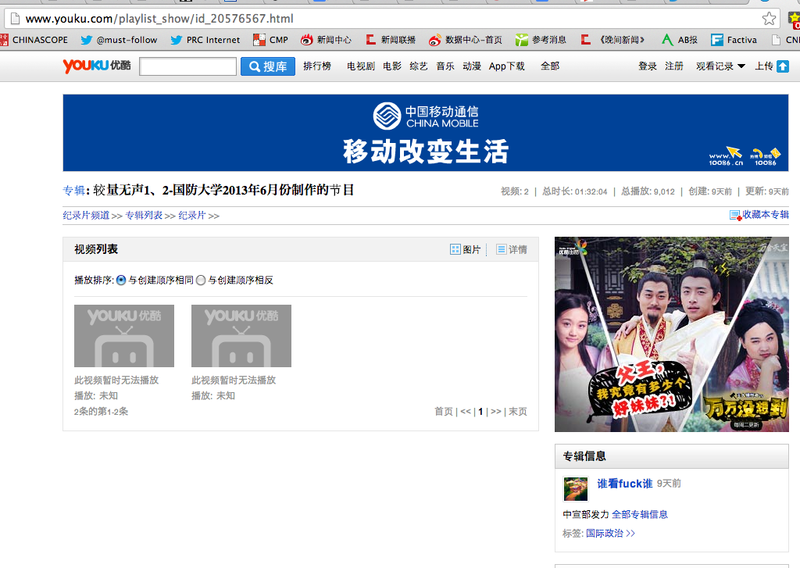 Screenshot of a Youku playlist of the film’s two parts, which was created 9 days ago. It was deleted sometime on October 31. If the leak was indeed authorized, it would probably have been at some level of the PLA General Political Department, which appears to be responsible for its production, given the prominence of the NDU Political Commissar as Producer (总策划). Political Commissars belong to the General Political Department, responsible for the military’s propaganda, ideological and educational activities. Liu Yazhou has a long association with the PLA’s propaganda system, dating back to his literary pursuits, through to his various positions in the PLA Air Force. Silent Contest makes deafeningly clear that powerful weaponry was no defense for the Soviet Union. There thus appears to be an implicit assertion of the importance of politics over kinetic weaponry that is consistent with the traditional tug-of-war struggles between political commissars and professional commanders in the PLA (on this, see Whitson The Chinese High Command). Some have wondered whether Liu Yazhou has changed his tune with this production, and his recent statements against constitutionalism and in favour of keeping the Party in control of the gun. From the limited reading of his past statements that i’ve done, i don’t think he was ever pro-US; he merely has a great respect and understanding of the political might of a country whose ideals can tolerate flag-burning at home and inspire flag-burning abroad. It’s not clear whether the documentary’s release online may have had an external motivation too; the response it inevitably provoked in the international China-watching community, and presumably among foreign governments too, suggests this is at least worth bearing in mind. If it was aimed at sowing confusion and doubt among foreign observers and governments, it does seem to have achieved that.